Quality Auto Center is excited to offer this 2016 Audi A8 L. 4.0T Sport - 450HP - Fully Loaded - CARFAX Certified 1 Owner - No Accidents - Fully Serviced - Quality Certified W/up to 10 Years, 100,000 miles Warranty COLD WEATHER PACKAGE CREDIT SAVINGS *DISCOUNT* BLACK ALCANTARA HEADLINER REAR SEAT COMFORT PLUS PACKAGE Seat-Massage Cooled Rear Seat(s) Heated Rear Seat(s) Rear Bench Seat DYNAMIC PACKAGE Locking/Limited Slip Differential WHEELS: 9.0 Tires - Front Performance Aluminum Wheels Tires - Rear Performance COLD WEATHER PACKAGE Heated Rear Seat(s) Transmission w/Dual Shift Mode Heated Steering Wheel Pass-Through Rear Seat BROWN/GOLD NATURAL FINE GRAIN ASH UPPER INLAYS Woodgrain Interior Trim MYTHOS BLACK METALLIC AUDI DESIGN SELECTION BALAO BROWN INTERIOR Woodgrain Interior Trim BALAO BROWN, VALCONA LEATHER SEAT UPHOLSTERY Leather Seats DRIVER ASSISTANCE PACKAGE Lane Departure Warning Lane Keeping Assist *Note - For third party subscriptions or services, please contact the dealer for more information. * Why does this vehicle look so great? The CARFAX report shows it's only been owned by one owner. Opulent refinements married with exceptional engineering make this the kind of car you'll want to own for a lifetime. This Audi A8 L features AWD. That means power and control delivered to all four wheels for maximum grip and improved handling. One of the best things about this Audi A8 L is that it has low, low mileage. It's ready for you to truly break it in. Intricately stitched leather and ergonomic design seats are among the details in which test drivers say that Audi A8 L is in a league of its own Let's be honest, not everyone wants to set a course blindly into the dark. For those of us that don't, there are vehicles like this with stellar navigation systems. You don't always know the details about a vehicle's past. This time you will have the service records to clue you in to how well it was cared for. This Audi A8 L is beautiful and the interior is clean with virtually no flaws. There should be no doubt in your mind about purchasing this 2016 A8 L 4.0T Sport - 450HP - Fully Loaded - CARFAX Certified 1 Owner - No Accidents - Fully Serviced - Quality Certified W/up to 10 Years, 100,000 miles Warranty. This lightly-used vehicle is still covered by the Audi factory warranty. Most vehicles are forgettable, but then there is the 2016 Audi A8 L 4.0T Sport - 450HP - Fully Loaded - CARFAX Certified 1 Owner - No Accidents - Fully Serviced - Quality Certified W/up to 10 Years, 100,000 miles Warranty. This high-performance vehicle provides a memorable experience each time you drive it. The engineers at Audi, without question, designed a masterful automobile that provides all of the essential perks needed for someone like you. Treat yourself to a wonderful driving experience in this wel- optioned Audi A8 L 4.0T Sport - 450HP - Fully Loaded - CARFAX Certified 1 Owner - No Accidents - Fully Serviced - Quality Certified W/up to 10 Years, 100,000 miles Warranty. Equipped with the latest in driver comforts, this Audi is the benchmark of modern automotive engineering. You'll enjoy improved traction and world-class handling thanks to the new tires on this vehicle. You know the the previous owner washes and polishes the vehicle with great care and detail? It's in impeccable condition. Stand out from the crowd as a 2016 Audi A8 L 4.0T Sport - 450HP - Fully Loaded - CARFAX Certified 1 Owner - No Accidents - Fully Serviced - Quality Certified W/up to 10 Years, 100,000 miles Warranty is a rare find and just may attract paparazzi. We are proud to offer this 2016 Audi that truly a must-have. 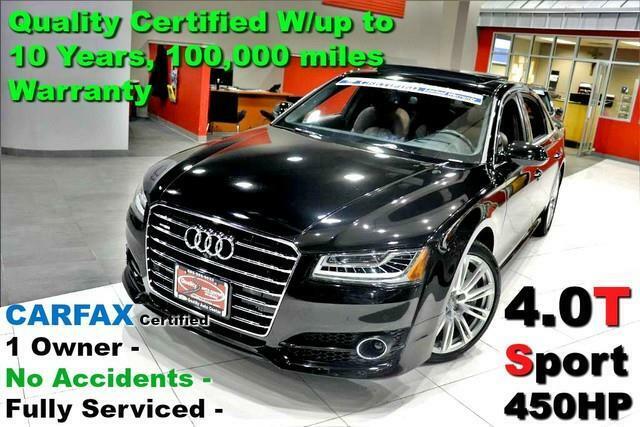 This vehicle's wheels are one of the many attractive features that this A8 L 4.0T Sport - 450HP - Fully Loaded - CARFAX Certified 1 Owner - No Accidents - Fully Serviced - Quality Certified W/up to 10 Years, 100,000 miles Warranty has to offer. No Credit / Bad Credit / No Paystubs, No problem !! ! All Approved ! Everyone drives ! CLEAN, GORGEOUS, LOW MILES, SHOWROOM CONDITION. CALL NOW QUALITY CERTIFIED up to 10 YEARS 100,000 MILE WARRANTY , To Certify a vehicle, there will be an additional cost for Certification. CALL NOW For details. STUNNING AGGRESSIVE LOOK ON THIS BEAUTIFUL--Call today to schedule a test drive... Good Credit/Bad Credit/No problem!!!! Get paid cash? No problem!! 100% Credit Approval with interest rates starting at 2.49% for qualified customers, our rates will not be beaten. We price our cars at wholesale price to guarantee the best deals for our customers. Our inventory moves quick, please call to confirm the availability of the vehicle of your interest Springfield location 973-564-0112. This vehicle is located at our SPRINGFIELD location. Come visit our new showroom in Springfield NJ. This 2016 Audi A8 L 4.0T Sport is proudly offered by Quality Auto Center Indulge yourself with one of the most highly crafted, most luxurious automobiles available today. No matter the weather conditions or terrain, this Black AWD Audi A8 L handles with an elegant confidence. Fine interior appointments complement this vehicle's unprecedented performance. It's not often you find just the vehicle you are looking for AND with low mileage. This is your chance to take home a gently used and barely driven Audi A8 L. Driven by many, but adored by more, the Audi A8 L 4.0T Sport is a perfect addition to any home. No Credit / Bad Credit / No Paystubs, No problem !! ! All Approved ! Everyone drives ! CLEAN, GORGEOUS, LOW MILES, SHOWROOM CONDITION. CALL NOW QUALITY CERTIFIED up to 10 YEARS 100,000 MILE WARRANTY , To Certify a vehicle, there will be an additional cost for Certification. CALL NOW For details. STUNNING AGGRESSIVE LOOK ON THIS BEAUTIFUL--Call today to schedule a test drive... Good Credit/Bad Credit/No problem!!!! Get paid cash? No problem!! 100% Credit Approval with interest rates starting at 2.49% for qualified customers, our rates will not be beaten. We price our cars at wholesale price to guarantee the best deals for our customers. Our inventory moves quick, please call to confirm the availability of the vehicle of your interest Springfield location 973-564-0112. This vehicle is located at our SPRINGFIELD location. Come visit our new showroom in Springfield NJ.